Neuropathology of Drug Addictions and Substance Misuse, Volume 2: Stimulants, Club and Dissociative Drugs, Hallucinogens, Steroids, Inhalants and International Aspects is the second of three volumes in this informative series and offers a comprehensive examination of the adverse consequences of the most common drugs of abuse. Each volume serves to update the reader’s knowledge on the broader field of addiction as well as to deepen understanding of specific addictive substances. 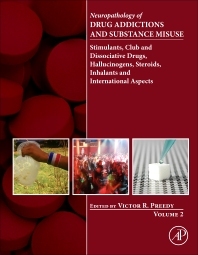 Volume 2 addresses stimulants, club and dissociative drugs, hallucinogens, and inhalants and solvents. Each section provides data on the general, molecular and cellular, and structural and functional neurological aspects of a given substance, with a focus on the adverse consequences of addictions. Research shows that the neuropathological features of one addiction are often applicable to those of others, and understanding these commonalties provides a platform for studying specific addictions in more depth and may ultimately lead researchers toward new modes of understanding, causation, prevention, and treatment. However, marshalling data on the complex relationships between addictions is difficult due to the myriad material and substances. Researchers and advanced students in behavioral neuroscience, neurology, addiction science, psychology and research psychiatry, with additional interest in biochemistry and pharmacology. Adolescence: A Time of Heightened Vulnerability? Ketamine as an Antidepressant—Betting on the Wrong Horse? Testosterone: Neurotoxic or Neuroprotectant Agent? Is Toluene the Offending Compound?